The NFIRE Near Field Infrared Experiment satellite of the Missile Defence Agency re-entered the atmosphere on Wednesday after eight and a half years in orbit to complete a demonstration mission of sensing equipment for the detection of thermal signatures of ascending ballistic missiles and the differentiation between the missile’s plume and the rocket itself. 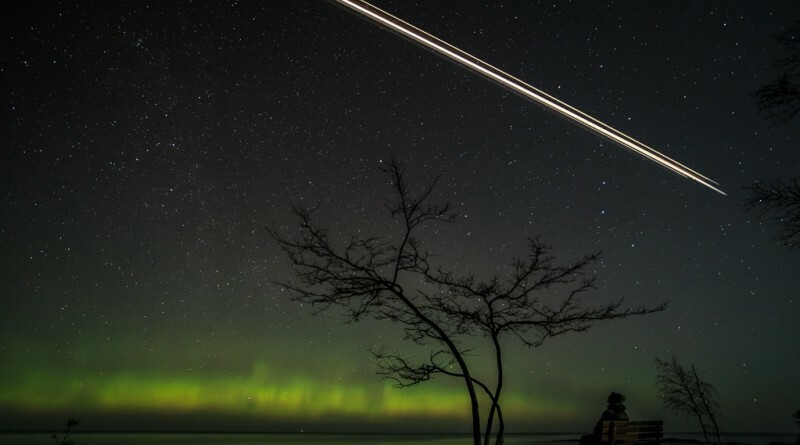 The Re-Entry of the 380-Kilogram satellite was seen from the Northern Continental United States with several reports coming from observers Minnesota, Michigan and Wisconsin who saw a fast-moving object streaking across the sky and breaking apart. NFIRE was developed by Spectrum Astro and the Air Force Research Lab under a $65 million Missile Defence Agency contract for a technology demonstration mission. The primary instrument of the satellite known as Track Sensor Payload was built to test technology differentiating between a missile and its exhaust plume which had been a challenge for boost phase missile defence. If the rocket itself can not be tracked properly, an interceptor may be fired at the plume rather than the rocket body itself. Data delivered by the satellite was put to use in the improvement of plume-to-hard body handover algorithms, navigation, guidance and control for boost-phase interceptors. MDA used results delivered by the mission in developing new guidance and homing algorithms and validation simulations. The camera system consisted of three cameras, one operating in the short/mid-wave infrared range, one in the long-wave range of the spectrum and a visible camera utilizing CCD detectors, Mercury-Cadmium-Telluride arrays and Indium-antimonide detector systems. Over 500 experiments were conducted with the Track Sensor Payload including two tests involving Minotaur-2 ballistic missiles being launched to engage the satellite at different miss distances. The NFIRE satellite also carried a Laser Communications Terminal built in Germany. The system was used to demonstrate the feasibility of satellite-to-satellite communication links using a laser system to achieve high data-rate communications with the SAR-X satellite and the optical ground system reaching data rates over 5 Gbps. 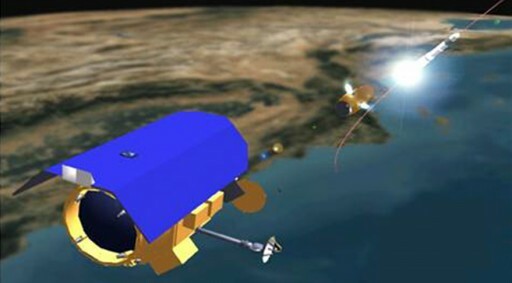 LCT was based on commercial-off-the-shelf technologies and demonstrated secure communications possible between two satellites, a satellite and an aircraft as well as space-to-ground communications. 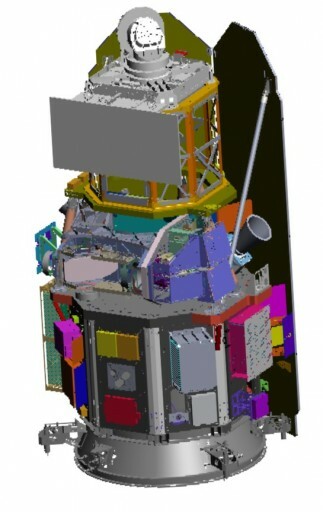 The NFIRE satellite had a launch mass of 494 Kilograms, measuring 2.65 by 1.31 meters in size when in its stowed configuration with a primary structure consisting of aluminum components. The satellite launched with 114 Kilograms of maneuvering propellant, leaving a re-entry mass of 380 Kilograms. Launching in 2007, the NFIRE satellite was in operation for over eight years, being officially retired in August 2015 when the satellite was already dropping in altitude, headed for an eventual re-entry. November 4, 2015 - 10:12 UTC +/-4 Minutes with an orbital decay location (80km passage) for the center of the Entry Window given as 38.6°N, 334.3°E placing orbital decay over the Atlantic Ocean, above the Azores. However, reports submitted to the American Meteor Society suggest that the re-entry of NFIRE was observed over the Continental United States at around 10 UTC. Reports were submitted from Minnesota, Wisconsin and Michigan located below NFIRE’s ground track when passing over the U.S.
NFIRE passed just north of Minneapolis at ~9:55 UTC from where a number of reports were filed, matching the location and timing of the satellite’s pass over the area. 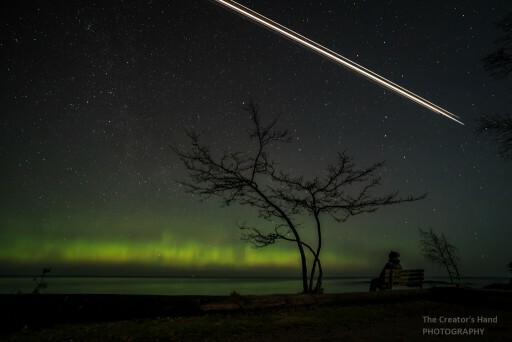 Witnesses report an object traveling faster than an airplane, but slower than a meteor, also reporting fragmentation typical for satellite re-entries. Observer reports indicate that the object was visible from 20 seconds to over one minute. 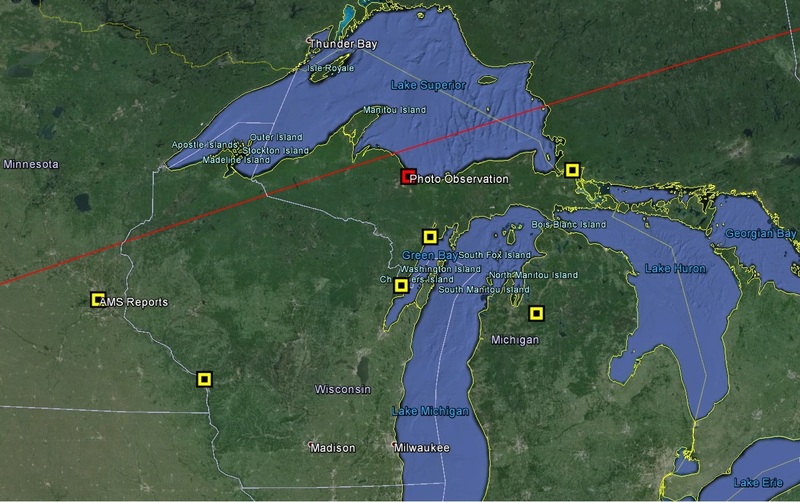 Because of the match in location below NFIRE’s ground track and the characteristic appearance of a satellite re-entry reported by observers, it is very likely that NFIRE re-entered over the northern United States, short of the decay location provided by JSpOC. The onset of re-entry normally occurs between 120 and 100 Kilometers in altitude when the spacecraft encounters the dense layers of the atmosphere, initially not slowing down at a fast rate, but already interacting with plenty of molecules that are broken up into atoms and ions leading to plasma forming around the spacecraft which would normally become self-luminous around 104 Kilometers in altitude. Given the extremely high speed of the object, traveling 7.8 Kilometers per second at Entry Interface, air in front of the vehicle is compressed, creating a shock wave layer in which molecules are separated into ions and temperatures rise to the extreme. The disintegration of the spacecraft usually begins at an altitude around 80 Kilometers (+/-10km) due to drag building up to a destructive force, triggering the onset of fragmentation of the spacecraft structure. The shock wave layer forming just in front of the spacecraft and any separated components leads to considerable heating that causes the incineration of the majority of the spacecraft structure. The mechanical deceleration experienced during re-entry can be up to 20Gs – further crushing the structural components and causing the break-up of the spacecraft. Temperatures reached during re-entry can melt most metal types used on the spacecraft and most of the fragments created on entry fully burn up, leaving a cloud of dust in the upper atmosphere. Given the structure of the satellite it is unlikely that any major components survived re-entry. Typically, objects that can survive the re-entry environment include the dense components of the thrusters and reaction wheels as well as smaller pressurant tanks and propellant tanks. Surviving debris that make it to the ground impact between 500 to 1,200 Kilometers downrange from the orbital decay point (80km in altitude) and their journey back to Earth is significantly influenced by cross winds which can create an off-track dispersion of the debris.